How can I describe them? one word: addictive. If you are not planning to make the cream cheese icing then just shove the idea of baking these rolls aside because the cream cheese icing is the secret ingredient. 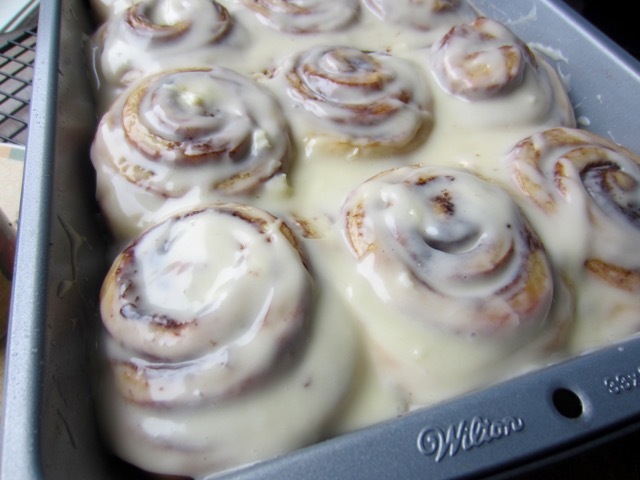 I can’t imagine these rolls without the cream cheese icing-it’s unacceptable. And by the way I ate four in one sitting then cursed myself for the rest of the week. Have a lovely week! Using a metal spoon mix into a soft dough. Turn out on a floured surface and knead 10 minutes until smooth and elastic. Place the dough in a lightly oiled bowl, cover with a lightly oiled cling film and leave in a warm place for about 1 hour or until doubled in size. Roll the dough into a rectangle 13-inches wide. Brush with the melted butter. Spread the cinnamon sugar over the melted butter leaving 1/2 inch border. Roll tightly from the 13-inch side. Cut off ends and cut into 12 1-inch (2.5cm) pieces. Arrange on the prepared pan and set aside, covered to rise. Brush with melted butter and bake 20-25 minutes or until golden. 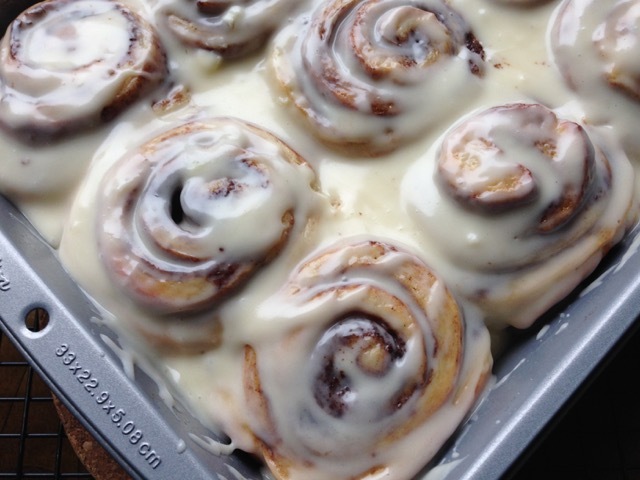 Do not over-bake. Make Cream cheese glaze: Beat together cream cheese and butter in a bowl until light and fluffy. Beat in powdered sugar and vanilla extract. Add enough milk or cream to give a pouring consistency. Pour over the baked rolls after resting for 5 minutes. Line a 13 x 9 x 2-inch (33 x 23 x 5cm) baking pan with parchment (greaseproof) paper. Preheat the oven to 375°F (190°C), 10 minutes before baking. I used instant yeast. If using active dry yeast activate it as per your product instructions. Sift or whisk the flour, salt, sugar and yeast into a bowl. Rub in the butter until the mixture resembles fine breadcrumbs. Make a well in the centre of the flour and pour the milk, egg and vanilla essence (extract) into the well, and using a metal spoon mix into a soft dough. Turn out on a floured surface and knead 10 minutes until smooth and elastic. Place the dough in a lightly oiled bowl, cover with a lightly oiled cling film and leave in a warm place for about 1 hour or until doubled in size. Turn out the dough on a lightly floured surface and gently pat or roll to a rectangle 13 inches wide (this is the shorter side). The length of the longer side doesn’t matter. Brush with the 3 tablespoons melted butter. Mix the brown sugar with the cinnamon and spread evenly over the rectangle leaving a border of about 1/2-inch (1cm). Roll tightly from the shorter 13-inch side and place seam side down making sure to seal the edges of the dough as best you can. Slice off the ends and then cut the rest of the roll into 1-inch (2.5cm) pieces using a sharp knife, serrated knife or floss. Arrange the rolls on the prepared pan and cover with lightly oiled cling film or polythene bag and leave to rise in a warm place for about 30-40 minutes or until doubled in size. Brush the risen dough with melted butter and bake 20-25 minutes or until light golden on top. Do not over-bake. 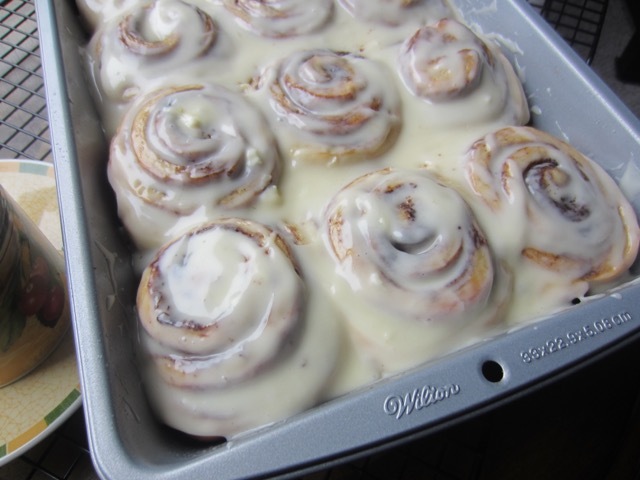 Remove from the oven and let rest five minutes then pour the prepared cream cheese glaze on top. Set aside to cool slightly then serve warm. Make Cream cheese glaze: Beat together cream cheese and butter in a bowl until light and fluffy. Beat in powdered sugar and vanilla extract. Add enough milk or cream to give a pouring consistency. Prev What is Durum Wheat? 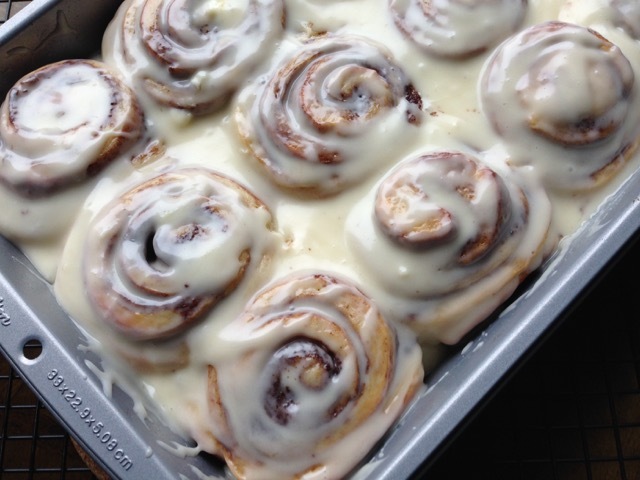 So much icing! 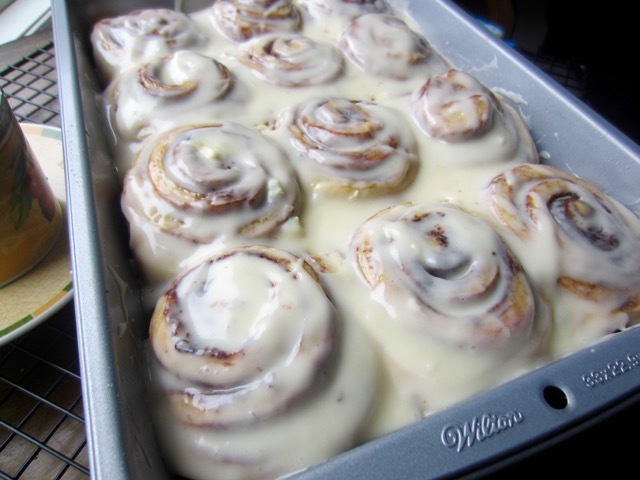 Cinnamon buns are probably my favourite sweet thing. This should only be eaten once a month…so full of calories!